Why does latent variable modelling in regression tend to push R Squared up? Hypothetically, say I have I have three manifest variables measuring anxiety and three manifest variables (items) measuring stress. Then I want to use both to predict scores on depression, which I'm also assessing via three manifest variables. I could simply add the scores on each of the manifest variables and create composite scores for Anxiety/Stress/Depress, then run a multiple regression. That approach is depicted in the following figure. Alternatively I could do latent variable modelling, as in the figure below. Whenever I've done this the R Squared has increased. Why does this happen? Are the reasons such that is it possible for the R Squared to instead stay the same, or reduce? 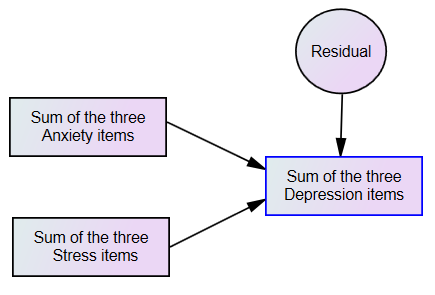 consider the two measurement model for Anxiety: in your first model you have given all three items equal weight, while in the second model you estimated the relative contribution of each of the items (in this case relative to item 3, so the loading for item 3 is 1). By fitting the relative contributions instead of constraining them all to be equal you are able to explain more of the variance, and thus R Squared should increase compared to your first model. Not the answer you're looking for? Browse other questions tagged multiple-regression latent-variable or ask your own question. Are latent variable models modelling causality? How to answer skeptic who points to latent variable? Dangers of treating residuals as latent variable? Why does probabilistic PCA use Gaussian prior over latent variables?